Glasgow-based Clydesdale Bank is to become the first to produce mainland UK plastic banknotes. Clydesdale polymer £5 notes go into circulation from today, well in advance of the Bank of England following suit in 2016. Plastic notes on the Isle of Man had a short-lived existence between 1983 and 1988. Apart from that, only millennium year commemorative £5 notes in Northern Ireland have been produced in a polymer version. The new notes are expected to last much longer and stay cleaner than their larger paper equivalent, while also being more difficult to counterfeit. Clydesdale’s move has been timed to coincide with the 125th anniversary of the opening of the Forth Bridge, which features on the back. A total of 2million commemorative notes – worth £10million – will eventually enter circulation, the bank said yesterday. 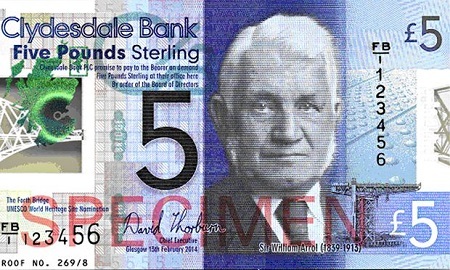 As well as new security measures, the fivers carry a portrait of prominent engineer Sir William Arrol, whose company was responsible for construction of the Forth Bridge and other famous Scottish landmarks. Clydesdale sought the help of Young Engineers and Science Clubs (YESC) Scotland and its Bearsden Academy branch, along with YESC ambassador and former TV weathergirl Heather Reid, to stress test the new notes under conditions akin to them being in circulation. Debbie Crosbie, the bank’s acting chief executive, said: “We take our responsibility as an issuer of banknotes seriously and are extremely proud to once again be leading the way in innovation. Clydesdale is the largest issuer by volume of notes in Scotland. It introduces around £400million of new notes annually and reached the milestone of having more than £2billion-worth in circulation on a single day earlier this year. The new £5 note is unlikely to be accepted in vending or self service machines to start with but this is expected to change in the coming months as machines are updated to recognise it. More than 20 countries have introduced polymer for some – or in some cases all – of their banknotes.